Teeth may be the hardest substance in the human body, but unfortunate accidents can still happen over the course of a person’s life. If you’re struggling with a smile that’s chipped, decayed, fractured, or even incomplete, Dr. Isaacson can provide the experienced and compassionate approach you need most here in OKC. Our restorative services are specifically designed to help teeth recover from harm, replenishing their strength and appearance in lasting ways. Please contact us today to schedule a consultation, or if you have any questions. Why Choose Joe Isaacson Dental for Restorative Dentistry? Dental crowns (also sometimes called “caps”) are a highly versatile and common restorative procedure that can help preserve what remains of a natural tooth that’s badly decayed, injured, weakened, or cosmetically flawed. 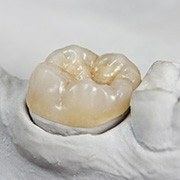 It’s designed to look like a tooth’s natural crown and will cover the entire visible structure once in place, rebuilding the original shape and bringing back much-needed function. 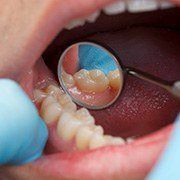 Dental bridges are named as such because they’re designed to literally “bridge” a gap left in the patient’s smile after the loss of multiple consecutive teeth. This sturdy prosthetic is anchored into place with the help of either dental crowns or modern dental implants, depending on the patient’s level of oral health and personal preference. Once in place, their new bridge will successfully restore biting strength and also prevent nearby teeth from shifting out of alignment. At Joe Isaacson Dental, dark-colored amalgam fillings have been left safely in the past. Instead, our team repairs the damage left by cavities with tooth-colored composite resin for a healthy, durable, and aesthetically pleasing result. This flexible material forms a direct bond with the enamel, which allows Dr. Isaacson to sculpt a smaller, more conservative filling and successfully preserve as much natural dental structure as possible. The lack of metals also means that the new addition won’t react as strongly to hot and cold temperatures, leading to more oral comfort. Dentures and partials have been around for hundreds of years now, helping patients who have lost most or even all of their natural teeth enjoy a complete, stable smile once more. Dr. Isaacson offers both traditional removable dentures here in-office and new, implant-retained prosthetics for added permanence and aesthetics. He will be happy to help you determine the right option for your goals and preferences during an initial consultation here in Oklahoma City. 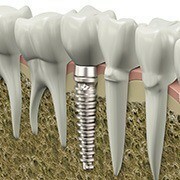 At Joe Isaacson Dental, we strongly recommend dental implants as the premier solution in today’s world for replacing missing teeth seamlessly. 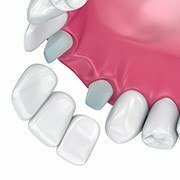 Unlike more traditional services, implants actually recreate every part of the natural dental structure, starting with the root that’s safely hidden within the jaw. By establishing this foundation and preventing bone deterioration (a common consequence of long-term tooth loss), we can help our patients reclaim not only their confident smiles, but their quality of life as well.